Explosive phytoplankton growth spreads blooms across hundreds of miles of ocean. What Is A Phytoplankton Bloom? Phytoplankton are microscopic plant-like organisms that grow, multiply, and drift in the sunlit surface waters of most bodies of water on Earth. The name “phytoplankton” is a combination of two Greek words: “phyton” (which means “plant”) and “planktos” (which means “drifter”). Phytoplankton occupy the base of the ocean’s food chain. Most of them contain chlorophyll and produce energy from photosynthesis. When present in high concentrations in the water, the chlorophyll in their bodies gives the water a green color. Other phytoplankton secrete skeletal material composed of calcium carbonate. In high concentrations these can impart a light turquoise color to the water. Normally phytoplankton are present and abundant in sunlit surface waters, but they are usually unnoticed by people on shore, passing by in boats, or flying over in aircraft. However, when conditions of temperature, sunlight, and water composition are perfect, explosive growth and procreation increase their numbers exponentially. These periods of explosive growth produce a green or turquoise color in and on the water, known as a “phytoplankton bloom”. Phytoplankton Through a Microscope: This photograph shows a coccolithophore, a one-celled, plant-like organism that lives a planktonic life in the shallow, sunlit waters of the ocean or other water bodies. Coccolithophores secrete and surround themselves with up to thirty plate-like scales composed of calcium carbonate, which are each just a few microns across. During a bloom, billions of drifting coccolithophores can cause the water to appear a very light turquoise color as sunlight strikes and reflects from their scales. When they die, their bodies sink to the bottom and contribute calcium carbonate to the bottom sediment. Creative Commons image by Hannes Grobe. Tiny phytoplankton are important contributors to the sediment cover in many parts of Earth’s oceans. They also play an important role in moderating the carbon dioxide content of Earth’s atmosphere. 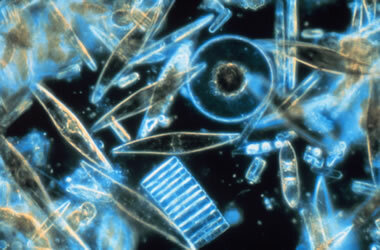 Phytoplankton absorb dissolved carbon dioxide from ocean water and release oxygen through photosynthesis. When they die, their bodies sink to the ocean floor, and they accumulate as a fine-grained organic material known as ooze. Diatom accumulations create a silica-rich ooze that might form a sedimentary rock known as diatomite. 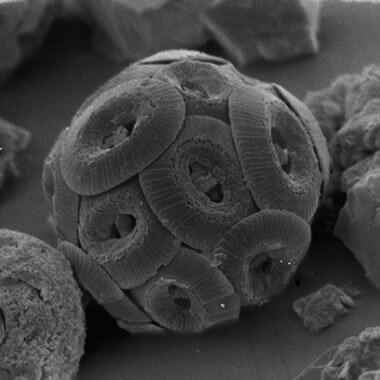 Coccolithophore accumulations create a calcium-carbonate-rich ooze that might form a sedimentary rock known as chalk. Both types of phytoplankton contribute dissolved carbon dioxide to the deep ocean water and organic-derived carbon to the sediment mass. This carbon can be locked in the deep ocean water and seafloor sediments for millions of years. As a result, the ocean becomes a carbon sink. In this way, phytoplankton remove carbon dioxide, a greenhouse gas, from near-surface waters and prevent it from entering the atmosphere. This removal of carbon helps regulate the carbon dioxide content of the atmosphere and, through that, regulates global temperatures. 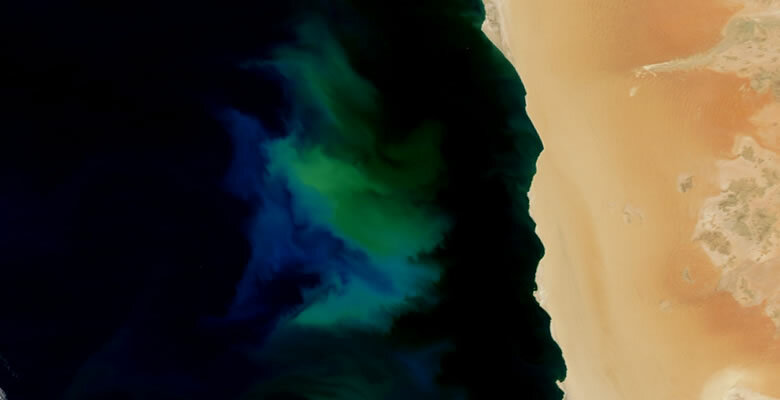 Phytoplankton Bloom Off Namibia an article on NASA's Earth Observatory website, accessed January 2019. Diatoms Through the Microscope, a public domain photograph by Gordon T. Taylor of Stony Brook University and distributed through Wikimedia, accessed January 2019. What Is A Coccolithophore? by John Weier, an article on NASA’s Earth Observatory website, accessed January 2019. 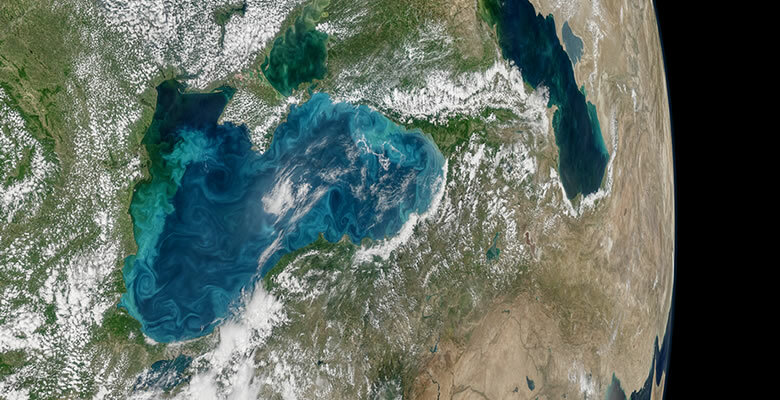 Turquoise Swirls in the Black Sea by Kathryn Hansen, Pola Lem, and Norman Kuring, an article on NASA’s Earth Observatory website, accessed January 2019. What Are Phytoplankton? by Rebecca Lindsey and Michon Scott, an article on NASA’s Earth Observatory website, accessed January 2019. 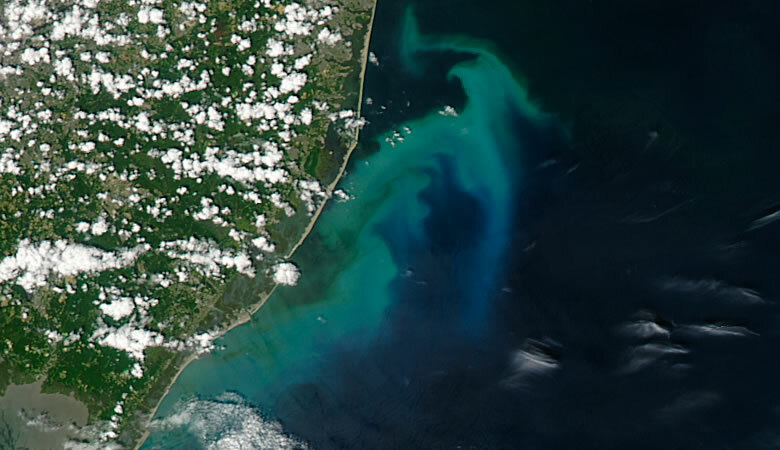 Phytoplankton Blooms Off New Jersey by Kathryn Hansen and Jeff Schmaltz, an article on NASA’s Earth Observatory website, accessed January 2019. 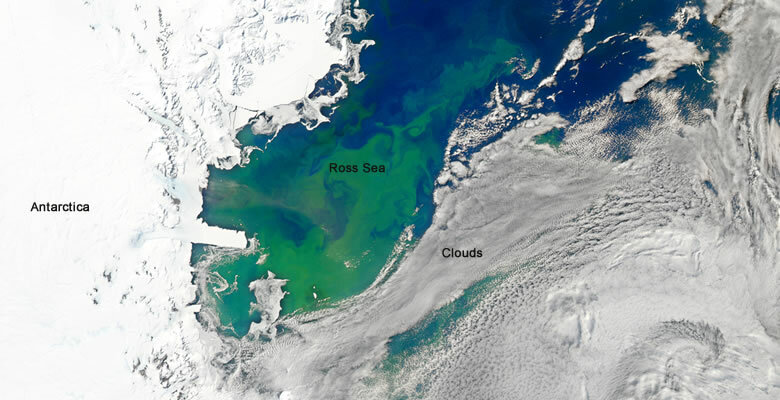 Bloom in the Ross Sea by Mike Carlowicz, Hugh Powell, and Norman Kuring, an article on NASA’s Earth Observatory website, accessed January 2019. 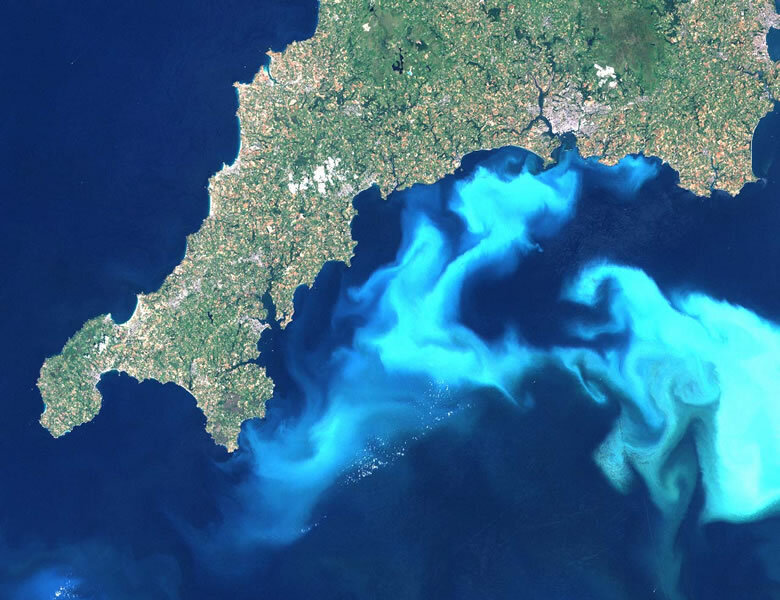 Bloom in the English Channel by Steve Groom, Plymouth Marine Laboratory, a public domain image hosted by Wikimedia, accessed February 2019. 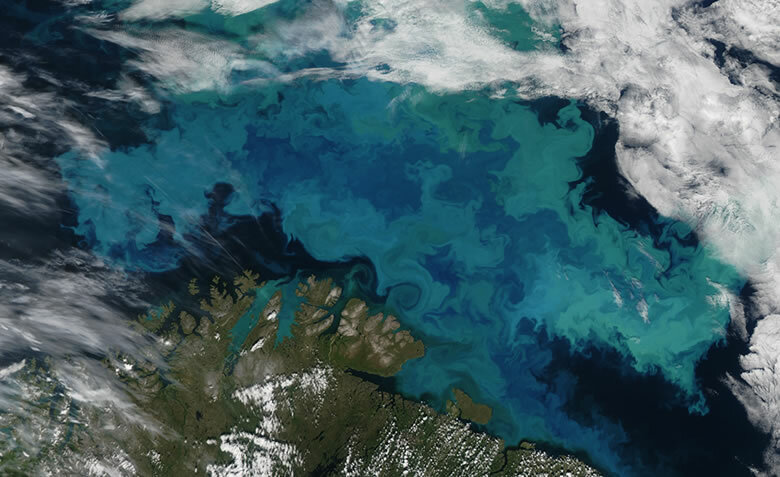 Bloom in the Barents Sea by Mike Carlowicz, Holli Riebeek, Barney Balch, Norman Kuring and Sergio Signorini, an article on NASA’s Earth Observatory website, accessed February 2019. Where Do Phytoplankton Blooms Occur? Phytoplankton blooms are most frequent in waters with a thriving marine population and where abundant nutrients needed for phytoplankton growth are added in a continuous stream, or in surges. These are often areas along the edges of continents where nutrients are supplied through river runoff, or where cold nutrient-rich waters from ocean depths rise to the surface. Blooms can also occur in freshwater bodies and are often triggered by agricultural runoff. When conditions are perfect, the abundant nutrient supply feeds the plankton’s explosive growth into a bloom.